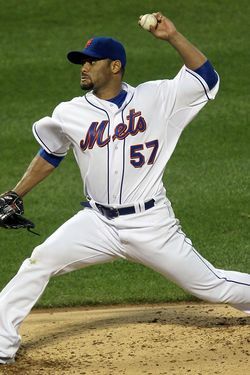 The last time Johan Santana pitched at Citi Field was August 28, 2010, against the Houston Astros. The Mets lost that game; Santana gave up four runs in seven innings, and the team fell to 64-65. Santana would pitch one week later, a win over the Braves in Atlanta, and he hasn't been back in the majors since then. It has been 587 days since Santana's last appearance at Citi Field. He has been paid roughly $26 million in that time. It's probably time for him to get back out there. The Mets open the 2012 season at Citi Field in about two hours, and with everything else going on with the Mets this year, everybody today will be watching Santana. He's not expected to throw more than 85 to 90 pitches, but after 587 days off, 85 to 90 pitches will do it. He'll be facing an Atlanta Braves lineup that's less imposing than it's sometimes given credit for, particularly against left-handed pitchers. Plus, it'll be gorgeous out. The game won't be a sell out, the first time that's happened on Opening Day in the new stadium, but it'll still be nicely populated. It's Opening Day. There have been worse lineups! Also to watch for: the new fences. Here's what the dimensions look like. There will, without question, be more home runs this year; the fear, actually, might be that they overdid it. But regardless — you guys, baseball is back. It starts today. Play ball, y'all.